A cherry picker's banner hangs above protesters in Harrisonburg on Sunday. Erin Murray organized the event on social media -- on Saturday. Rebecca Sprague, Church World Service Community Program Coordinator. Harrisonburg City Schools Superintendent Scott Kizner. Saber Khoshnaw is from northern Iraq and said, "I love America. I'm proud of America." Nalen Ramos, 14, said, "All my best friends are Muslim, and they've told me multiple times before that they're scared of what's happening to our country." Ronald Johnson said, "I have Iraqi friends here. I mean they'll never be able to go back to see their families. They're here with working visas, they're here legally but they can't go home and see their family for fear of not being able to return." Hundreds of protesters attended the rally. Jim Moore raised the cherry picker over the street with a large banner proclaiming, "Immigration built our nation" and "One nation without fear, without hate." "I hate to see everyone drinking the kool-aid," he said. Hundred of students, faculty, and area residents gathered on UVA's Lawn to protest a series of executive orders issued by President Trump towards immigrants and refugees. The protest marched down UVA's Lawn and circled back through campus, lasting more than two hours. Hundreds of protesters attended the rally at Harrisonburg's Court Square. In cities and airports across the nation this weekend protesters responded to the recent executive order signed by President Trump that bans immigrants from seven countries with Muslim majorities. WMRA’s Christopher Clymer Kurtz filed these excerpts from what people had to say at a rally in Harrisonburg yesterday. If the Sunday noon rally on Harrisonburg’s Court Square sounds like it was spontaneous and impassioned, that’s because it was. ERIN MURRAY: My name is Erin Murray and I just organized this yesterday afternoon. SCOTT KIZNER: We always say that the strength of our school system is our diversity. We accept everyone and we love everyone. REBECCA SPRAGUE: We have 14 people on our list that have flights scheduled that are not going to be able to come now. SABER KHOSHNAW: My son-in-law today in Kurdistan of Iraq -- Yesterday he is American with my daughter citizen and granddaughter citizen, and somebody tell them you are not American today. Moore said he’s had a hard time listening to the news recently. JIM MOORE: I hate to see everyone drinking the Kool-Aid. In Charlottesville, WMRA's Jordy Yager filed this report from the UVa grounds. 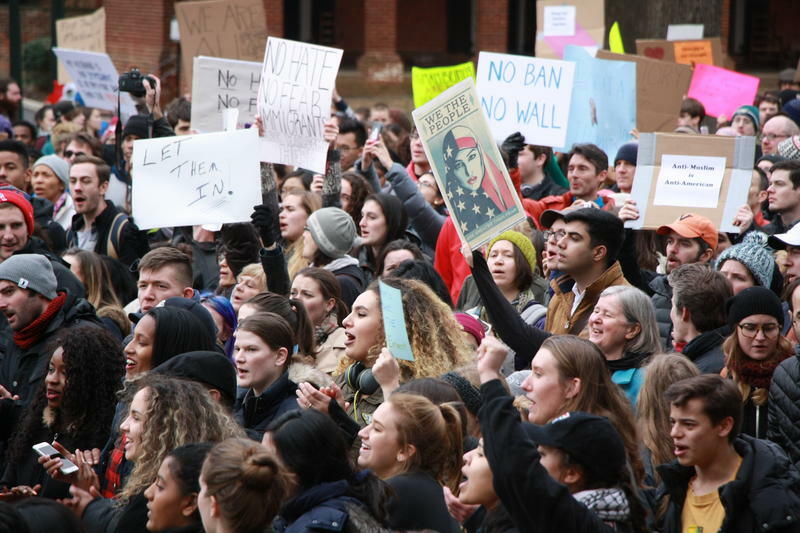 About 700 people gathered outside the University of Virginia’s Rotunda Sunday to protest a recent series of executive orders issued by President Donald Trump. The actions take aim at immigrants in the U.S. illegally while also temporarily halting the arrival of refugees, and issuing a 90-day ban on citizens traveling from seven predominantly Muslim countries. A group of UVA students over the weekend wrote University President Teresa Sullivan. Sophomore Hannah Melissa Borja read the open letter before Sunday’s crowd. She is a member of the DREAMERS on Grounds, a UVA group that advocates for undocumented students. HANNAH MELISSA BORJA: We demand that you, as a university, take long overdue action. Prove to your students that you care, that you stand behind them, and that you will protect their access to higher education at all costs. Several other students spoke, as did Charlottesville Vice-Mayor Wes Bellamy. 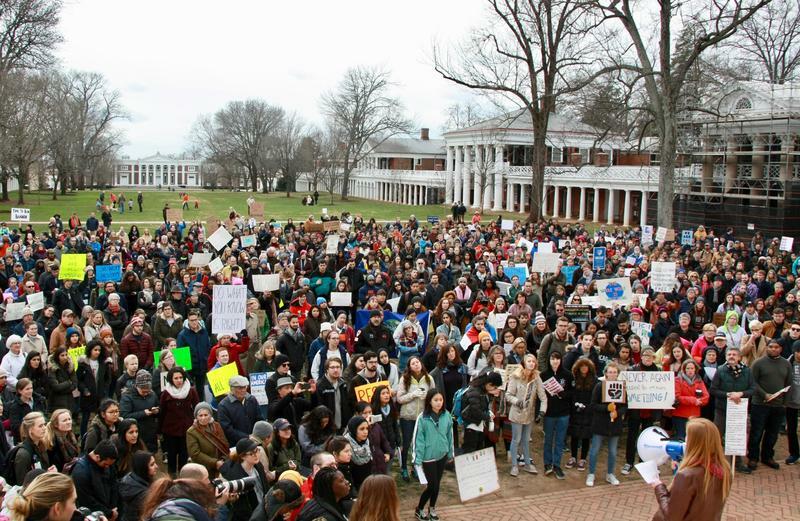 The crowd marched down the UVA Lawn circled through campus and rallied in front of the Dean of Students office.